What makes for successful marketing? There are some skills and abilities that marketers must need to get a job done. However successful marketers know they are in the business of forming and forging relationships. So how do you forge relationships without taking up extra time and energy? The answer lies in making it part of your existing conversations and activities. Here are three key habits that will help go a long way to forging strong relationships with influencers. Social media is one of the most natural places to build connections with people. Better still it is free and you can do so with no pressure. Need to start building relationships with those you may not know at all. Try Twitter. You can start with simple retweets or comments. Did someone Retweet, favorite or like a post? Then thank them for taking part. Gary Vaynerchuk is one of the most responsive people on social media that I know of. Buffer utilizes the same principle in another technique. 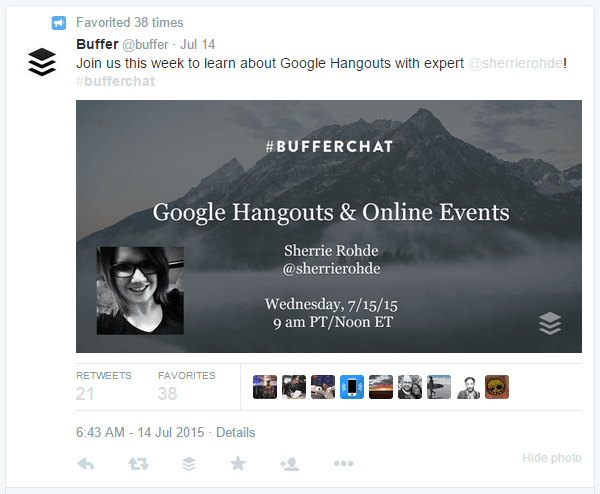 They have created a #Bufferchat Twitter session. How do you do something similar? Choose a topic that is important and that you care about in your industry. Start a conversation around it. Assign an appropriate #hashtag so that people can take part and be heard. Don’t have a big following? Engage with others on an existing and established hashtag chat. You can find relevant topics via this directory. Use these engagement opportunities to provide help or solutions to people’s problems. Help by answering questions, generating conversation, asking questions and recommending products or apps that will help audience members. Don’t use it as an opportunity to flaunt your products or services. Engagement can become a serious activity. It doesn’t hurt to let other knows about your fun side. People may not see or be able to talk to you. But they would relate better to you if they can see the human side of your business or brand. Ben and Jerry do an especially great job of this. They showcase their product in unique, fun ways. As a result they create a lot of conversation around them. Check the post below as an example. Focus on your audience. Ask yourself if your conversations and content add value to your audience? If it doesn’t, then you would need to stop and reevaluate. Chances are that your fans or followers are constantly looking for solutions or content that can help them improve. So give it to them. Look at Pat Flynn’s Twitter account. He also mixes in a healthy dose of his (and family’s) adventures. As well as his engagement with various people and ventures. The post on Serena Williams is one such example. How do you add value to your audience? It boils down to getting to know your audience, their interests, desires, dislikes, etc. You can then create or curate content that meets what they are after. And what they are likely to engage with. It’s not as hard as you might think. Just ask a few revealing questions of your audience. How do they relax on a Sunday afternoon? What benefits are they looking for in your product or service? What sites do they visit? What articles are they reading? What are they most passionate about? What do they care most about? There are quite a few apps and online tools to help with this. You could also conduct content research via BuzzSumo or Ahrefs. Being able to forge relationships through various platforms can seem quite overwhelming at times. It can also be hard to draw any conclusions about effectiveness. That is unless it is all tracked, tested and measured. For example, there are sources that provide stats about the ideal length of a tweet, post, etc. These should only be used as a guideline. Your audience is unique and is likely to have its unique likes and dislikes. So test what you think works and even what you think would not work. The results might surprise you. Keep testing till you find the sweet spot with your audience. You may be tempted to test many things at the same time. I would recommend testing just one thing at a time. Test it with variations and by exposing it to a decent sample size. Tweak according to the results of your test. That way you are making informed decisions and not guessing. Building relationships is not an act but a habit. and measuring effectiveness are critical to forging relationships with influencers. Applying these habits will see your relationships flourish, and your impact explode. Are you finding it difficult to build consistency? Try using the one percent improvement formula to gain mastery. 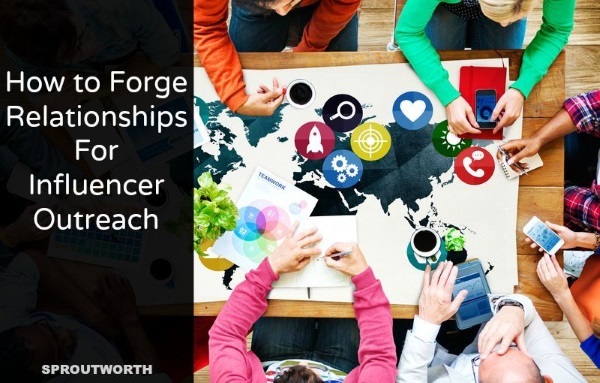 So what are you doing to forge relationships for influencer outreach? You article is simply amazing!! I’m new to blogging and I want to know is it compulsory for a blogger to maintain his/her blog on social network ? Thanks for stopping by Ovais. Glad you liked it. You might like this post on influencer marketing as well. Hi Vinay! I really like the way you have portrayed the entire message in such a simple and precised manner. Every single example is worth a thousand words and perfectly depicts the true message to the content. Great work.